I thought it would be fun for you all to get a little peek into the process and approach I took for my latest design project. I do not always take the same steps when I approach each new custom blog design project. My methods vary, but I do spend a great deal of time doing research on every client before I begin putting together an idea collage for each design. A client completes my Custom Blog Design Order form and pays in full for the design. Once a form has been submitted, I receive a notification through email. Below are a couple of helpful links for those of you thinking about investing in a custom blog design. 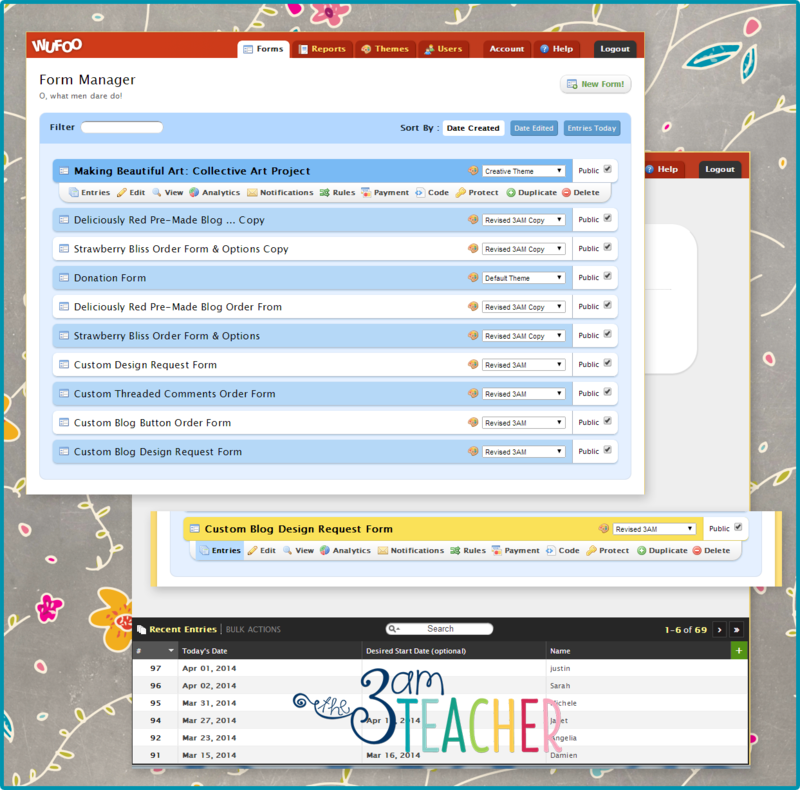 I use Wufoo forms to create and organize the forms I need to keep my business running smoothly. At $29.00 a month, it is well worth the price. 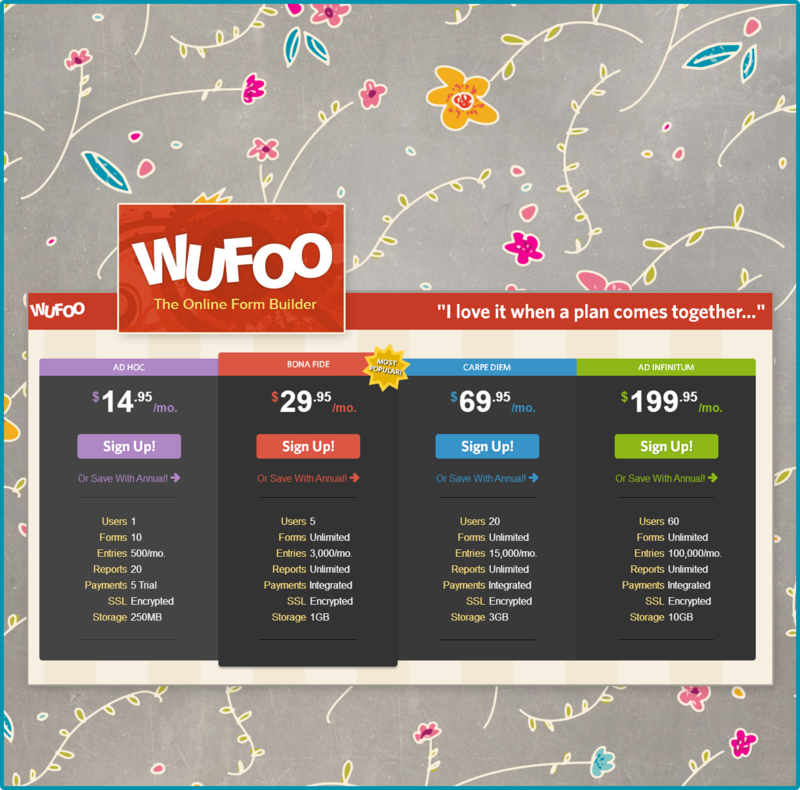 Wufoo is a web application that allows users to create customization forms. You must have a pro account to add payment options to your forms. Click the image below to find out more. Once I am logged into my Wufoo account, I can see all of the forms I have created. If there is a new entree, a number will appear in red under the title of the form. Once I hover over the title, a tool menu appears and I can choose to see the entries, edit, view, and/or choose from several other options. To print the form, I click on the entries link and locate the name of the person who submitted a custom blog design order form. Once I click on a name, all of the information appears in the top portion of the screen. Due to private and sensitive data, I did not include a screenshot of a completed form below. 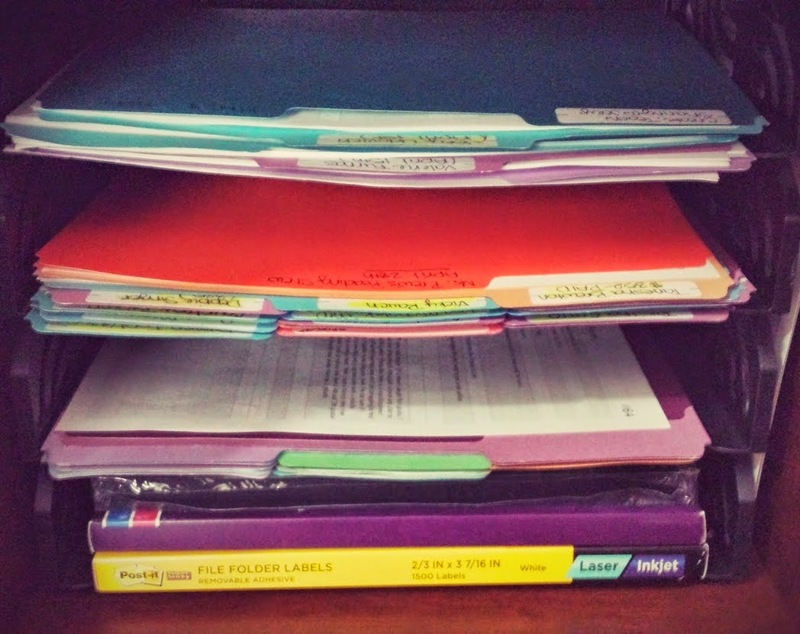 I use simple, multi-colored file folders and sticker labels for my client file folder hard copies. 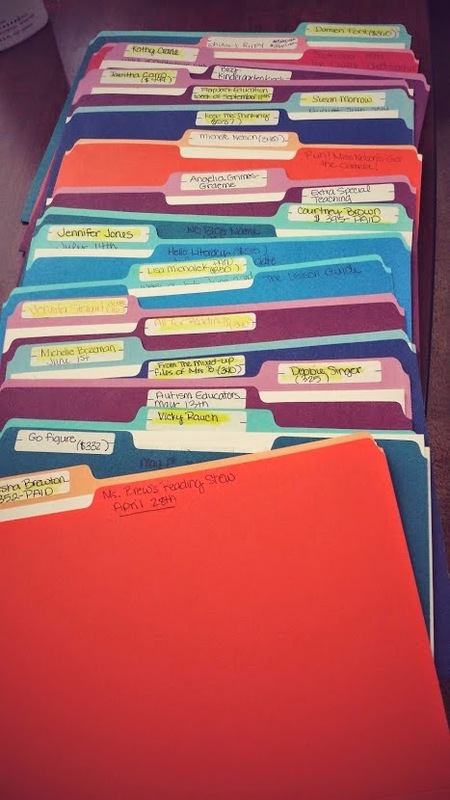 I store the folders in a simple paper tray and place them in order by months; starting with the earliest month on the top. This way, I can just pull the next folder in the stack. I purchased an ugly standard desk calendar to use specifically for custom blog design orders. Because I scheduled custom blog designs for the year, I was able to complete most of the calendar for the year. 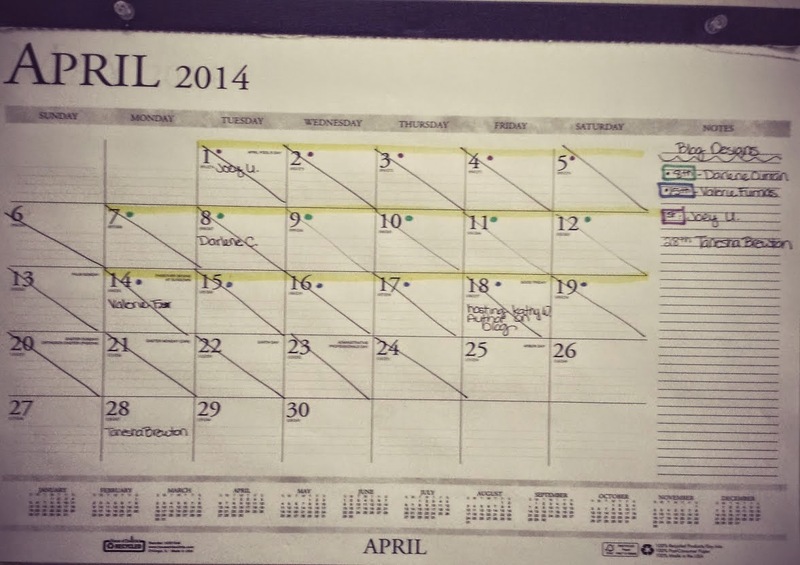 The calendar hangs on my wall behind my desk and keeps me on top of my schedule. When I receive a new order, I check for the most recent available dates before emailing the client. Once the client agrees on a start date, I explain the process and let him/her know that I will send an email to schedule a phone conference closer to the start date of their design. Although a bit scary at times, I believe that a phone conference is important to follow through with as a designer. Talking on the phone allows me to connect with each client and get a better sense of the direction and purpose of each design. I take notes during the conferences and I find that much of what the client originally wrote in the form is not actually the direction they really want for their design. This is why the phone conference is vital to the foundation of this process. Speaking to each client on the phone also allows the client to place a real person on my end. Here is a blurry (intentional) picture of the custom blog design client folder of the design I will be showing you. I use the conference to get clarity on color choices, font choices, purpose and goals for the design as related to a business or personal blog, and to write down anything else that might be important as I begin putting together ideas for the design. I always have the folder open while I am working on a client's design, so I don't have to try and search for the information. 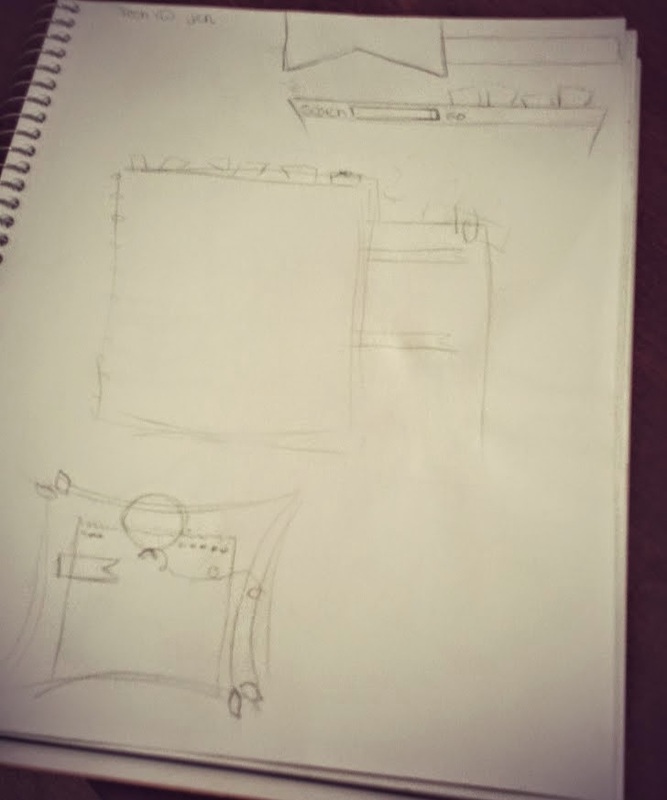 Most times, I immediately get ideas for a design and will begin doing rough sketches to get my ideas flowing. The sketches are VERY rough and I typically just play around with ideas while they are fresh in my mind. 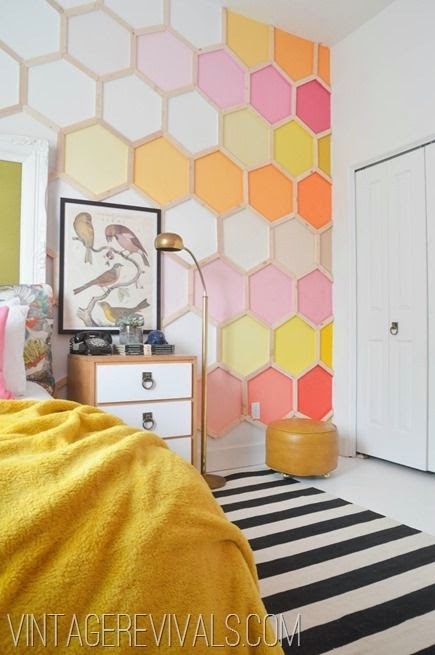 I make a strong point to not look for inspiration from other blog designs and instead, I get inspiration from interior design, color swatches, pictures, and anything else un-related to graphic design to spark some ideas. The reason I do not want to look at other design work for inspiration is because I want my designs to look and be original. Many times, clients will send me images from other blog designs they like. Although I allow this, I really do not like clients sending me pictures of other blog designs. There is no way to have an original design if one is trying to piece together elements they love from a variety of designs they have seen. This never works out and is often a big headache as I try to create a design with particular elements that do not really go well together. I actually prefer that clients trust me enough to come up with a design based on the completed form and our conversation. When a client wants to take control over the process and is not sure what he/she wants, it adds a great deal of work and pressure for the designer. 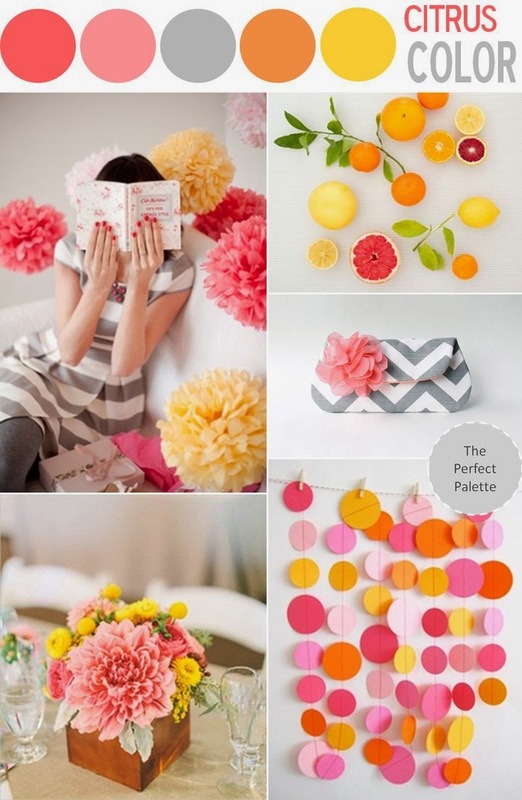 I REALLY loved how the black and white stripes complemented the citrus colors without pulling away from the overall theme. I was certain I wanted to use that concept within this design. This is the part of the process that typically takes up the majority of the time. I spend a great deal of time creating patterns and a background, and making sure the background works on a test site before sending the design preview to a client. 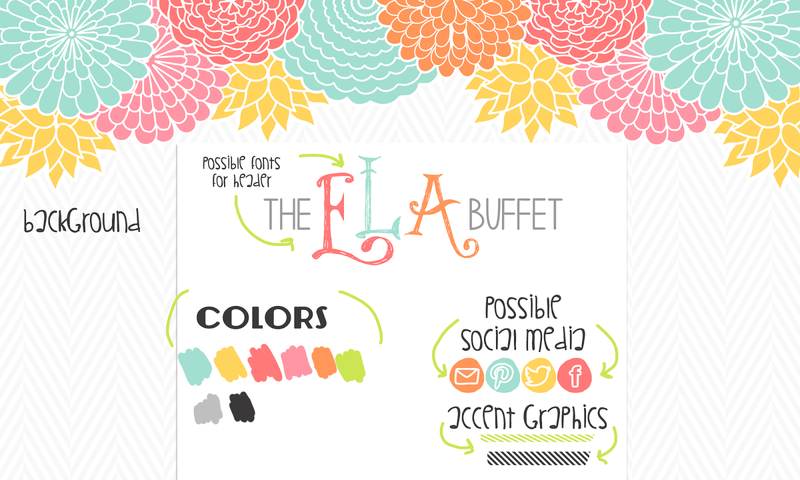 I also choose a font and colors that complement the overall theme, purpose, and personality of the design. Each font has its own personality and choosing a perfect font is often a major challenge. When I am given control over the design by a client, I am able to see the design as a whole as I am putting elements together. I am able to send over a complete design preview for these clients, which makes the process much quicker. For clients that like to be in full control, but are often unsure what they really want, I will only work on one element at a time. Once that element is approved, I will move on to the next element. Because these clients are unable to see the design as a whole when they are giving me specifications to work with, they often end up wanting to go back and make more changes as the design begins to take shape. This is why it is very important to make sure you trust your designer and allow him/her to listen to your needs and create something for you. Designer Tip: Make sure to have very clear guidelines when you begin working with clients. Make sure you have included fees for excessive revisions and don't be afraid to require a fee when you have made several changes and the client is requesting more changes after already approving an element. I know this is often very difficult to do, but this is a business and your time is valuable. I have made this mistake more than I would like to admit and I end up calculating my hours- only to find I have made just pennies per hour. Prevent this early on and if your client values you and your work, he/she will be happy to pay the extra fees for excessive changes. Always keep track of the amount of time you invest in each design. This will help you determine whether you are meeting your financial and business goals. Here is the initial idea design preview I sent to Darlene. As you can see below, I pulled quite a bit from the photos above. I used a tall chevron pattern in a very light gray and then filled the top of the background with bright, hand-drawn flowers that make the colors pop. For the social media buttons, I just painted an uneven circle shape using my design program and Cintiq and drew the icons above in white. I even added a place to incorporate those black and white stripes I loved so much from the image I used for inspiration. No matter how much I love the design I came up with, I am ALWAYS nervous as I wait to hear back from each client. Waiting can be nerve-racking, but more times than not, the clients are very happy and excited when they see the direction I came up with for their design. Darlene did not request any changes at this point and gave me the green light to start putting the test site together. I believe that providing a test site for each client is a vital part of my process. I want to make sure that the client can see the finished design as it will appear online before I upload the design to his/her blog. I do not expect that my clients have the ability to visualize what the design will look like online, so therefore, I provide visual communication with a test site. Once I have uploaded the design elements and coded the test site for the client, I email the client the test site. Once the client has had time to look at the test site, we discuss any minor changes that might need to be considered before the final design is completed. In this instance, Darlene wanted me to add a few books to the header and darken the gray colored text in the header as well. Those were both very minor changes that I was more than happy to do for her. Once those changes were made, I emailed her to let her know and waited for the final approval. 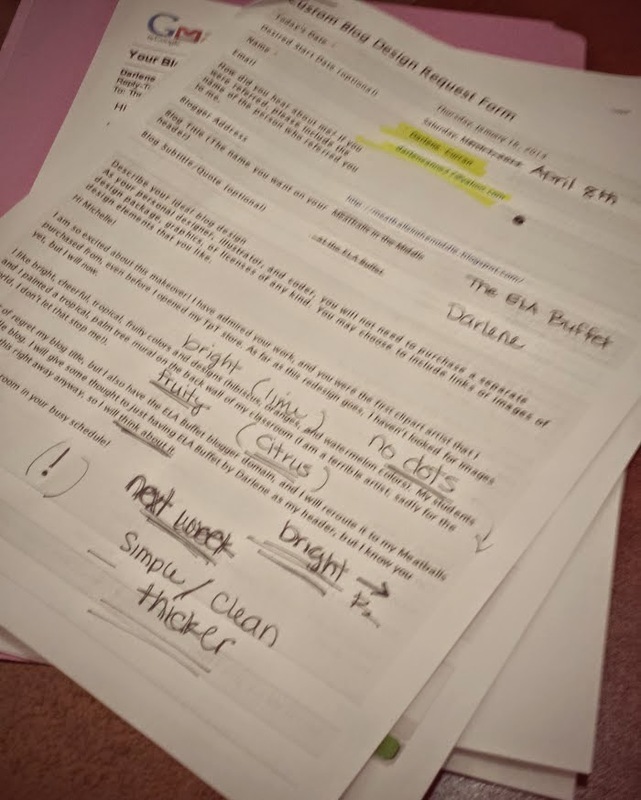 Once Darlene approved the final changes, I sent her an email with a pre-made PDF of directions for her to follow in order to add me to her blog as an author. I will not use anyone's usernames or passwords, so I require that each client add me to their blog. Click the link below to see the PDF I send my clients... Feel free to use this PDF, but please make sure to link it to my site if you share it. 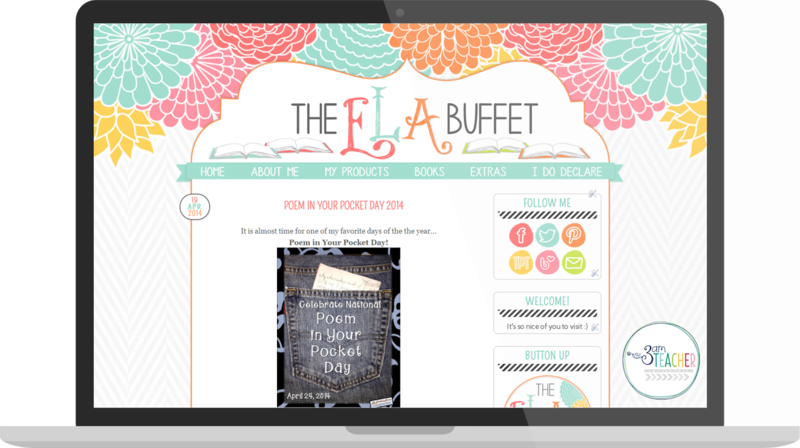 Thank you Darlene for trusting me to give your blog a new design!! Some custom blog designs take me over 80 hours and others I am able to complete in less than 5. It just depends on the client, the design, and the amount of custom illustrations needed for a particular design. Although I did not include all of the boring details, I hope you all enjoyed getting a little peek into my process. I love everything about this, Michelle; thanks for the peek into your profession. I think my favorite thing is the phone contact. As much as I like and use social media, I miss the phone. I feel sad that when the phone rings, I wonder "what's the matter?" or I can predict with certainty that it's a telemarketer or my husband. I used to LOVE talking on the phone and I miss those days of old. You are a gifted and talented artist, my friend. I appreciate the look into what you love. Thank you so much & you are sooo right!! Getting a phone call now is not quite as exciting before the age of social media!! We always get worried when the phone rings late at night... Funny how much has changed in such a short amount of time. I loved reading about your process. I have often wondered if I should get a custom design for my blog, and I definitely feel more comfortable with the idea after reading this. Thanks! You for the inspiration. I admire your work soooooooo much. Wow! Thank you so much for sharing!! I was wondering do you design buttons for a link up?! I am looking into starting a link up and really love your designs! !